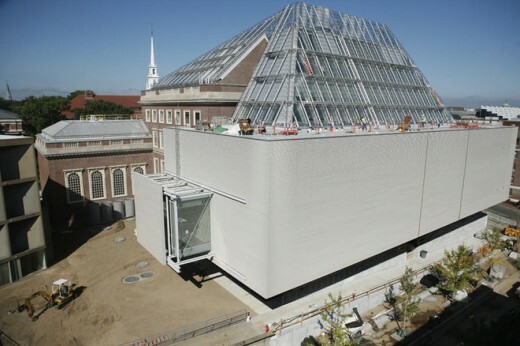 Renzo Piano’s Harvard Art Museum Project, Cambridge, MA. 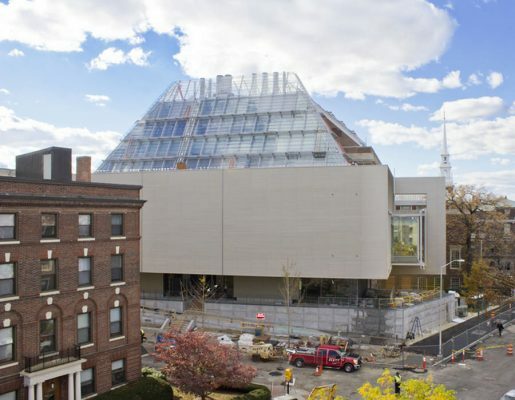 The Harvard Art Museums—comprising the Fogg Museum, the Busch-Reisinger Museum and the Arthur M. Sackler Museum—today announced that the renovation and expansion of the landmark building at 32 Quincy Street in Cambridge, Massachusetts, will open in the fall of 2014. Designed by architect Renzo Piano, the transformative facility will bring the three museums and their collections together under one roof for the first time. The expansion will create new spaces and resources to advance the Harvard Art Museums’ mission of teaching across many disciplines, conducting research, training museum professionals, and presenting exhibitions and programs for the Harvard University community and the public. The building that currently houses the Arthur M. Sackler Museum at 485 Broadway has remained open since the renovation and expansion project began in 2008, providing ongoing access to the collections of all three museums. 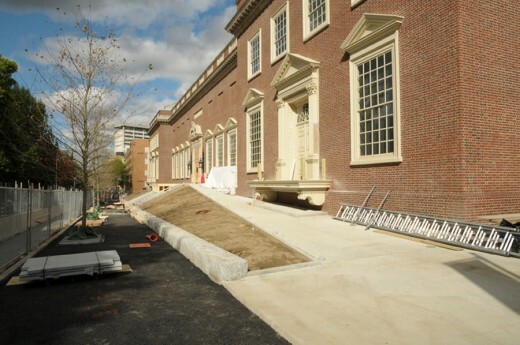 The current Sackler galleries will close at the end of regular hours on June 1, 2013, in order for the Harvard Art Museums to conduct the final phases of the project, including packing and moving collections and preparing to install the galleries in the new facility. The building at 485 Broadway will remain open for staff, faculty, students, and events. The special exhibition In Harmony: The Norma Jean Calderwood Collection of Islamic Art will be on view at that site through June 1, 2013. The new facility will provide opportunities for the Fogg, Busch-Reisinger, and Arthur M. Sackler museums to exhibit their collections in new ways—with dialogue and juxtapositions between objects from different cultures, time periods, and media—and will provide a flexible and innovative model for multidisciplinary study and learning. The expansion will strengthen the Harvard Art Museums’ role at the forefront of visual arts research and scholarship, while providing broader public access and a dynamic cultural space for the Cambridge and Greater Boston communities. The close, intimate viewing of works of art has long been central to the Harvard Art Museums’ role as a preeminent training ground for arts professionals. The new exhibition galleries are being designed specifically to create places for the unhurried examination of and engagement with individual works of art—for both the Harvard University community and the general public. wHY Architecture, a design architecture firm with offices in Los Angeles and New York, is designing the interiors and casework for these new spaces. The Harvard Art Museums have raised $230 million in private philanthropy through gifts and grants from many individuals, foundations, organizations, and government agencies. This amount represents 93% of their initial $250 million fundraising goal. Significant leadership support has been received from donors such as Emily Rauh Pulitzer, David Rockefeller, the Calderwood Charitable Foundation, Richard and Ronay Menschel, and the Horace D. Chapin estate. In addition, the project has received support from the Massachusetts Cultural Facilities Fund, a state-funded agency. All funds contributed have been dedicated to capital costs for construction and renovation, as well as to enhancing the endowment for operating costs. In January 2013, the Harvard Art Museums received a generous gift from the German Friends of the Busch-Reisinger Museum. The $5 million gift will support one of the three art study centers planned for the new facility, where visitors will have access to thousands of works of art from the Harvard Art Museums’ vast collections. Founded in Germany in 1983, the Friends of the Busch-Reisinger Museum/Verein der Freunde des Busch-Reisinger Museum now has more than 240 members, based in Germany, but active also in other countries, including Austria, Switzerland, and the United States. This dynamic and internationally minded group supports the multifaceted work of the Busch-Reisinger Museum, with special emphasis on teaching and research activities. Together, the Fogg Museum, the Busch-Reisinger Museum, and the Arthur M. Sackler Museum have holdings that are among the largest and most renowned in the United States. Totaling over 250,000 objects, the Harvard Art Museums’ collections consist of works in all media from ancient times to the present. An initiative to provide digital access to these collections was launched in 2009. Located at www.harvardartmuseums.org/art, the site provides access to a range of information and images for each object in the museums’ collections. Over 99% of the objects in the collections are included and 90% are represented with a downloadable image. This resource has provided ongoing access to collection records throughout the renovation and expansion project. The most complex and time-consuming aspects of the renovation and expansion project have now been completed. 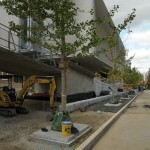 Begun in June 2008, the project thus far has included the relocation of staff and collections, demolition of later additions to the historic 1927 building, substantial excavation to create new underground spaces, and construction of significant additional gallery and other space (a total of 100,000 square feet of new space). The exterior walls of the new space, and the steel-and-glass rooftop that spans the facility, were finished in December. The new facility, which totals 204,000 square feet, is now weathertight, and work has begun on the build-out and finishing of interior spaces, which are expected to be completed this fall. Conditioning of the facility and installation of the collections will take place in 2014. A central aspect of the expansion is the enhancement and restoration of the historic 1927 museum structure at 32 Quincy Street and its central Calderwood Courtyard. The project will add over 12,000 square feet of new exhibition space, increasing the Harvard Art Museums’ gallery space by more than 40%. The new facility will have six levels of public space connected by a central staircase. The Calderwood Courtyard and surrounding arcades on five levels will serve as the hub of activity and circulation among the facility’s new galleries, study centers, and other areas. A new lower level will provide additional space for education, teaching, and public programs. The Harvard Art Museums’ new design opens up all of the courtyard’s ground-floor arcades and, in select areas on the upper levels, introduces glass walls that create a dramatic physical dialogue between interior spaces. Two partial glass exterior walls provide views into gallery spaces from street level and views from the building to the surrounding architectural landscape. The original entrance on Quincy Street will now connect through the building to a new entrance on Prescott Street. The design engages in new ways the adjacent Carpenter Center for the Visual Arts—the only building in the United States designed by Le Corbusier—both with windows providing new sight lines to the building and by the extension of Corbusier’s ramp to intersect with the museums’ new Prescott entrance. • Art Study Centers: A central feature of the new facility, the three new art study centers will provide access to thousands of works of art from the vast collections of the Fogg, Busch-Reisinger, and Arthur M. Sackler museums. Distinct areas for study and research will offer students, faculty, and the public purpose-built environments for learning through the close examination of original works of art. 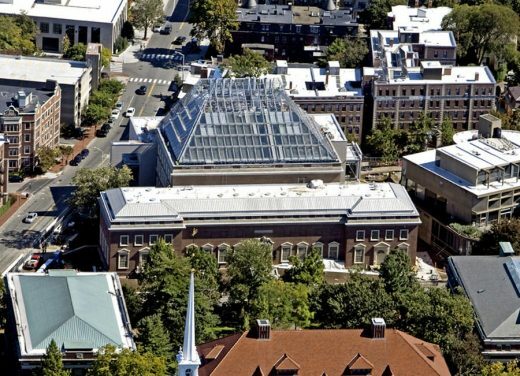 • Straus Center for Conservation and Technical Studies: The Harvard Art Museums house the first fine arts conservation, research, and training facility established in the United States. The Straus Center will be located on the facility’s uppermost level, below a glass rooftop structure that will allow controlled natural light into the center and into the Calderwood Courtyard below. A glass wall will enable visitors to observe conservation and research activity in the Straus Center. • New Exhibition Galleries: Expanded permanent collection and special exhibition galleries will be complemented by teaching galleries, programmed in consultation with students and faculty to support specific coursework. These teaching galleries, which are open to the public, can also be used for curatorial studies and training or provide additional space to support the program of the art study centers. • Lightbox Gallery: This new gallery space on the top level of the Harvard Art Museums will showcase the intersections of art and technology using a number of different multimedia platforms. • Calderwood Courtyard: The historic heart of the Fogg Museum, the courtyard has been restored as the central point of circulation among the three museums on the ground floor. In the same manner, the upper-level courtyard arcades provide a connection and central orientation point for visitors to galleries and the study centers. With its new glass rooftop, the revitalized courtyard offers interior views through the five upper levels of the facility. • Theater, lecture spaces, and classrooms: A 300-seat theater for presentations, performances, and discussions will be created on the new lower level, and lecture and classroom spaces will be established throughout the facility for use by Harvard faculty and students and for public workshops and events. An additional studio space on the lower level will allow for installations by working artists, video presentations, and educational programs. • Museum shop and café: The shop and café will be located off the courtyard on the first floor as part of a new open circulation path through the building. Visitors will be able to enter the new facility from either the original entrance on Quincy Street or the new entrance on Prescott Street, both leading to the courtyard with direct access to the shop and café. Entry to the galleries will be administered separately, via the admission desk. The Renzo Piano Building Workshop, along with local design partner Payette Associates, is the architect for the project. Renzo Piano is an internationally recognized architect who has designed many other museum facilities, such as those at the Art Institute of Chicago, the Kimbell Art Museum, the Los Angeles County Museum of Art, The Menil Collection, The Morgan Library & Museum, and the Nasher Sculpture Center. Piano is particularly known for creating beautiful and thoughtful renovations of historic structures. Technical Studies, the Center for the Technical Study of Modern Art, the Harvard Art Museums Archives, and the Archaeological Exploration of Sardis). The Fogg Museum is dedicated to Western art from the Middle Ages to the present; the Busch-Reisinger Museum focuses on works from central and northern Europe with a special emphasis on the art of German-speaking countries; and the Arthur M. Sackler Museum is dedicated to Asian, ancient, and Islamic and later Indian art. Together, the collections include approximately 250,000 objects in all media. The Harvard Art Museums are distinguished by the range and depth of their collections, their groundbreaking exhibitions, and the original research of their staff. Integral to Harvard University and the wider community, the museums and research centers serve as resources for students, scholars, and the public. For more than a century they have been the nation’s premier training ground for museum professionals and are renowned for their seminal role in developing the discipline of art history in this country. www.harvardartmuseums.org, www.harvardartmuseums.org/renovation. While studying architecture at Harvard’s Graduate School of Design (GSD), Justin Lee lived in an apartment on the corner of Prescott Street and Broadway, directly across from the Harvard Art Museums, reports the Harvard Art Museums website. Lee studied late into the night at the GSD, crashing at his apartment for a few short hours before rising early for class. When Lee graduated in 2004, he couldn’t wait to leave Cambridge and begin his professional career. So when Lee landed a job with the Renzo Piano Building Workshop (RPBW) in Genoa, Italy, it was a perfect fit. But little did Lee know this position would send him right back to the same intersection he was once so eager to flee, working as the on-site architect managing the renovation and expansion project of the Harvard Art Museums.